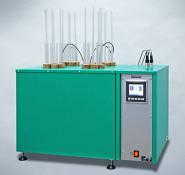 Stress Relaxation, continuous Stress relaxation, continuous testing systems for continuous and automatic measurements, compression and tensile, according ISO 3383 and ISO 6914. 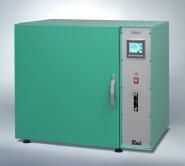 Accelerated ageing test oven Cabinet testoven for rubber ageing is available with a fixed air exchange of 7 or 14 times per hour. Accelerated ageing, test oven Accelerated ageing, in accordance to ISO 188 method A. 4 cells with individually controlled temperature. Ageing test, tube oven Accelerated ageing of rubber, in air and liquids. Test tube oven, large capacity, 24 test tubes for 3 samples each. Ageing tests, ISO 188, IEC 811 Cabinet oven for ageing tests with shelves. Meets the specifications in accordance to ISO 188, IEC 811. 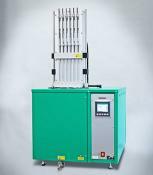 Heat ageing test oven Heat ageing test oven with a high velocity, laminar air flow from bottom to top. Test conditions in accordance to ISO 188, method B and ISO 4577. 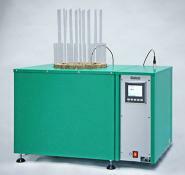 Heat ageing test, liquids, air Rubber ageing tests in liquids and air. 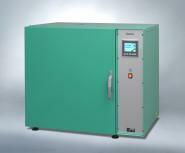 Time saving because of testing simultaneous at three temperature levels. Rubber Abrasion test compliant with ASTM D8115 and PV 3984. About 80% saving in time and material costs, versus the ISO rotary drum test. Gehman Tester Gehman Tester for determination of the relative stiffness characteristics of vulcanized or thermoplastic rubbers. TR-tester TR Tester. Determination of low temperature characteristics by the temperature retraction method.